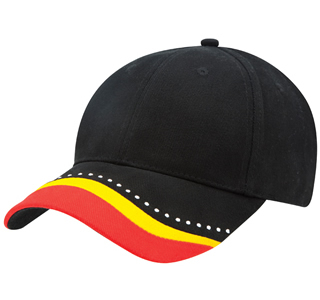 Baseball Cap with Aboriginal Theme depicts Australian indigenous designs with it’s colourful dot embroidery on the peak. Made from heavy brushed cotton. A structured 6 panel cap. Features a pre curved peak and embroidered eyelets. Padded cotton sweatband inside the cap. Customised with an embroidered logo or full colour digital transfer logo of your organisation.